One of Audrey Hepburn’s most famous roles in “Wait Until Dark” is being revived by USU Eastern’s theatre department. The psychological thriller from the ‘60s is set to open on center stage in the Black Box Theatre on two consecutive weekends: Oct. 5-7 and 12-14. “Wait Until Dark” opened on Broadway in 1966 and has been a staple of theatre programs throughout the United States since. It was made into a major motion picture in 1968 starring Audrey Hepburn, Richard Crenna and Alan Arkin. Hepburn was nominated for an Academy Award and a Golden Globe Award for her portrayal of Suzy Hendrix. USU Eastern’s play is set in 1968, the same time the film was released. Corey Ewan, Ph.D., the play’s director and costumer designer, worked hard to create the right look for the costumes. “The audience isn’t really all that savvy about fashion trends, so I stretched the time period by a year or two. Of course, if I mess up, only a few will know.” He hopes the audience enjoys and reminisces about his view of the ‘60s fashion statements. The set was designed by Spencer Potter, scenic designer for Westminster College. 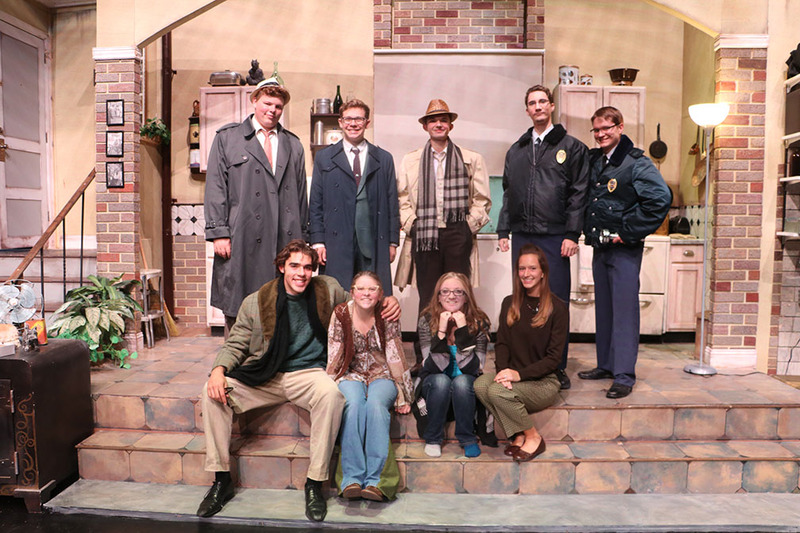 The set was used in the summer production of “Wait Until Dark” by the Old Lyric Company in Logan. The Lyric production was a new adaptation set in 1944. USU Eastern theatre department purchased the set and Brent Innes used his set design expertise to piece it together to fit the Black Box Theatre. “It was like putting together a jig saw puzzle, and Innes created a unique design for our production that audience goers should like,” Ewan said. While the set works for both time periods, some of the props had to be replaced to fit the ‘60s. Lighting duties were designed and created by Tynan Peacock (Tooele High School). “He has created a sense of menace and unease, which plays right into the mood of the play,” Ewan said. It is a tribute to our program that at this level a student can design for a main-stage production. Casting for the play includes Veronica Roberts (Stansbury Park High School) in the role of Susy Hendrix with her husband played by Gabe Marcotte (Da Vinci Academy). Tate Sommerfeldt (Cardston High School) tackles Harry Roat, Jr., with Zachary Ballard (Cottonwood High School) playing Mike Talman and Hayden Buss (Orem High School) portraying Sergent Carlino. The final actors include Morgan Innes (Carbon High School) playing Gloria with Paul Shaw (Copper Hills High School) and Nathan Carter (Pinnacle Charter School) playing police officers Ganz and Gorman. Curtain time for all performances is at 7:30 p.m. Ticket prices are adults $12, seniors $10 and non-USUE students $7, faculty and staff $7 while USU Eastern student with current USUE ID $3, and children and USUE theatre alumni $5.